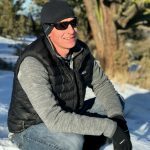 Recently, we interviewed one of the Ladd Group’s featured builders, Cameron Scott of Ollin Construction here in Bend, Oregon. Cameron is the builder of an exceptional property located in Tetherow’s Cascade Vista neighborhood: 61379 Lost Hollow Loop. Tell me about the design inspiration & vision you had for this house? The design and vision was a collaboration and we were inspired by previous Tour of Homes houses in Tetherow that led us to build this home in an “alpine contemporary’ design style. We really tried to stay true to the roof pitches of the neighborhood across the street had as well as an Alpine/mountain lodge feel from the exterior. When you step inside that you feel the contemporary theme. Moderate tones and sharp lines make the home feel roomy and very comfortable, light and bright. What are your favorite elements of this home? I love the kitchen and dining room layout! I think that kitchen is really fresh and open and inviting. I love to cook! To be able to prepare and eat on the West facing side of the home is pretty cool given all the windows and light on that side of the house. To watch those stunning sunsets throughout the year over the jaw dropping cascade mountains would give me a continued source of inspiration and joy in the preparing and presenting of food. When you get into the Master Bedroom and lay down with a good book to read and you could get lost in the sunsets from that room as well! Don’t even get me started with the starry nights and full moon sets over the mountains and how pretty those would be at certain times of the year! I really like all those windows; they really all seem to face the right way. What are a few features you are especially proud of in regards to building quality? I really am not very good at cutting corners. So, I really feel that from foundation all the way through the interior finishes, I really tried to make sure that we didn’t sacrifice quality in any area of the house. I am really proud of the finished product. I think this will be a very rewarding location and an easy to maintain home for the upcoming new owners. I guess my favorite all around feature would be the openness of the home and all the natural light, we really tried to take advantage of that in every single room. I have recently been invited to Big Sky MT, to participate in the second annual TEDX event next January. I am sharing about the powerful life changing benefits of Transformational Breath-work. I guide classes every couple of weeks here in Bend and I love helping people who are willing to lay on a yoga mat, set a couple of new intentions, and watch their life change doing nothing more than some active breathing for 30 minutes once a week. You can find us on Facebook, just search for SoulRoar Breathwork and come try out a class. What upcoming builds are you excited to be working on? We are about 40% through construction on a new home in Tetherow at 61321 Tetherow Vista Dr. This single level 2650 sqft home has stunning mountain views, it looks out over Tetherow and the Highlands. The home is designed by Jason Todd, and is has a Farmhouse/Industrial feel. 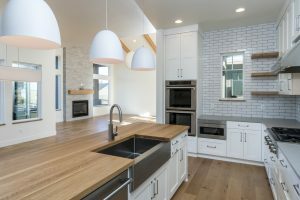 We have some really cool interior features, such as high vaulted ceilings, Thermador appliance package, lots of warm tones and lots and lots of windows and slider doors off of the back of the house that make this home feel really expansive and roomy. With really large front and back patio areas, a gas fire pit and lots of room for entertaining, this home will attract a lot of attention in the coming months. We hope to be complete in mid April. Great interview with a very interesting and talented builder.